I’m scrambling to get everything done before I leave for England and SVPCA this weekend, so no time for a substantive post. Instead, some goodies from old papers I’ve been reading. Explanations will have to come in the comments, if at all. Streeter (1904: fig. 3). 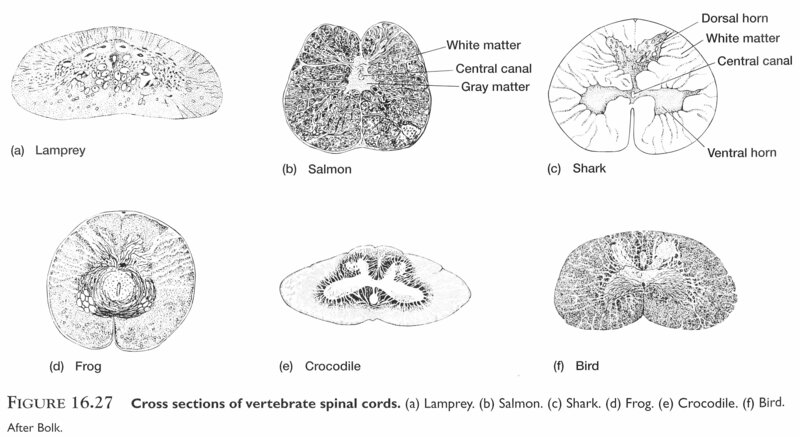 Compare to the next image down, and note that in birds and other reptiles the spinal cord runs the whole length of the vertebral column, in contrast to the situation in mammals. Nieuwenhuys, R. (1964). 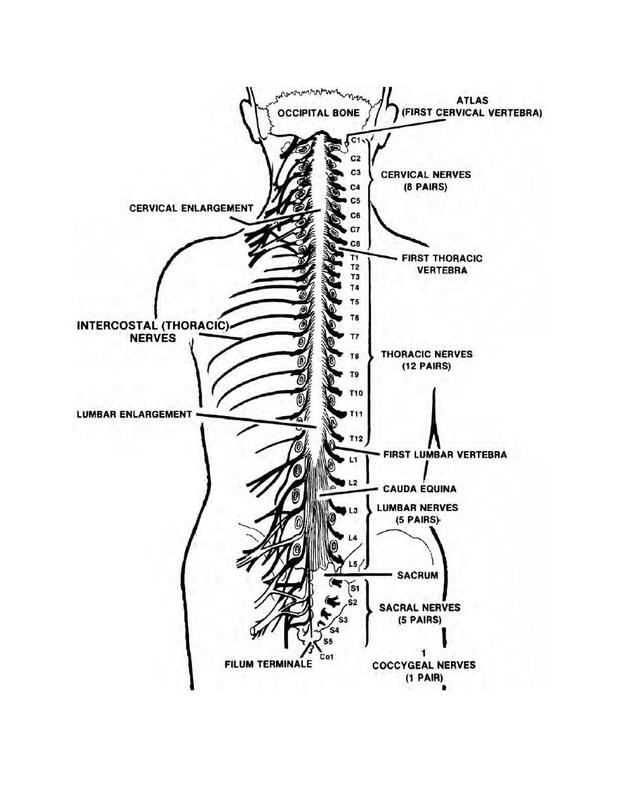 Comparative anatomy of the spinal cord. Progress in Brain Research, 11, 1-57. Streeter, G. L. (1904). 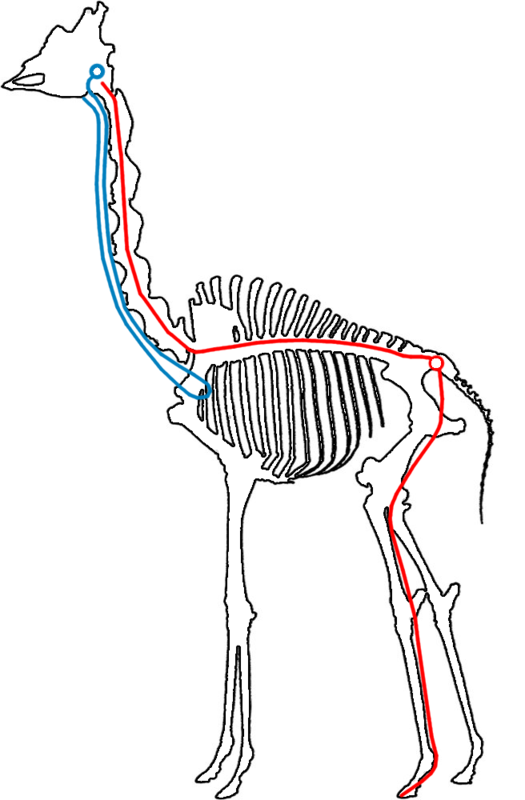 The structure of the spinal cord of the ostrich. American Journal of Anatomy, 3(1), 1-27. My friend, colleague, and sometime coauthor Dave Hone sent the above cartoon, knowing about my more-than-passing interest in sauropod neurology. It was drawn by Ed McLachlan in the early 1980s for Punch! magazine in the UK (you can buy prints starting at £18.99 here). 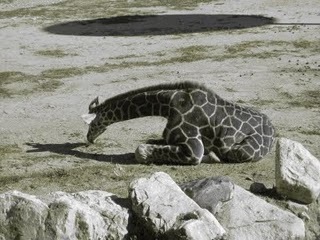 I know that this isn’t the only image in the “oblivious sauropods getting eaten” genre. There’s a satirical drawing in Bakker’s The Dinosaur Heresies showing a sleeping brontosaur getting its tail gnawed on by some pesky mammals. I’ll scan that and post it when I get time (Update: I did). I’m sure there must be others in a similar vein–point me to them in the comments or email me and I’ll post as many as I can get my hands on. So how long does it take to send a nerve impulse 150 feet? The fastest nerve conduction velocities are in the neighborhood of 120 meters per second, so a signal from the very tip of the tail in a 150-foot sauropod would take about half a second to reach the brain. Is it possible that sauropods had accelerated nerve conduction velocities, to bring in those distant signals faster? To the brain, probably not. 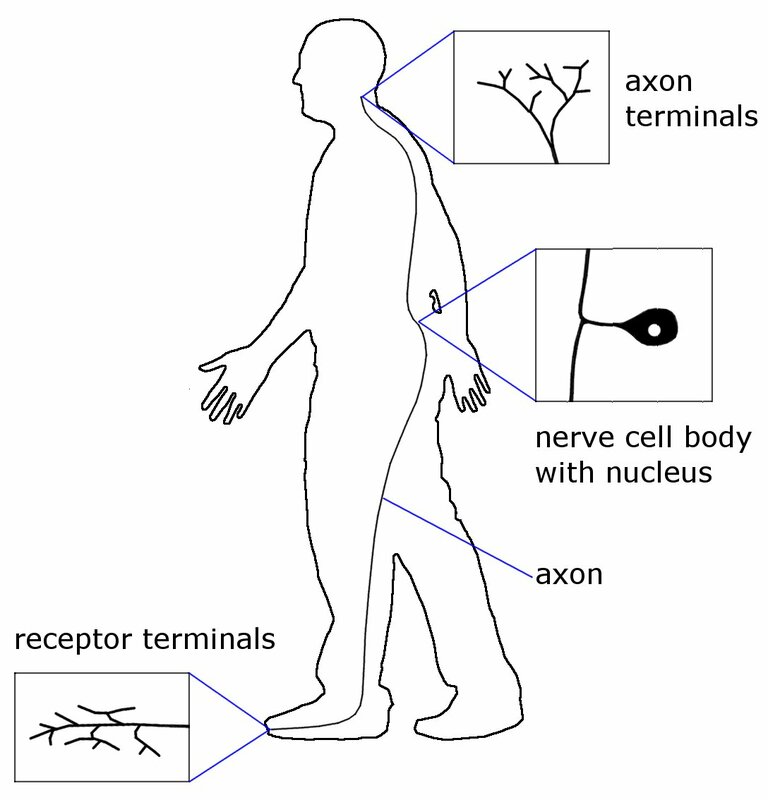 The only ways to speed up a nerve impulse are to increase the diameter of the axon itself, which some invertebrates do, and to increase the thickness of the myelin sheath around the axon, which is what vertebrates tend to do (some invertebrates have myelin-like tissues that apparently help accelerate their nerve impulses, too). Fatter axons mean fatter nerves, and for at least half the trip to the brain, the axons in question are part of the spinal cord. 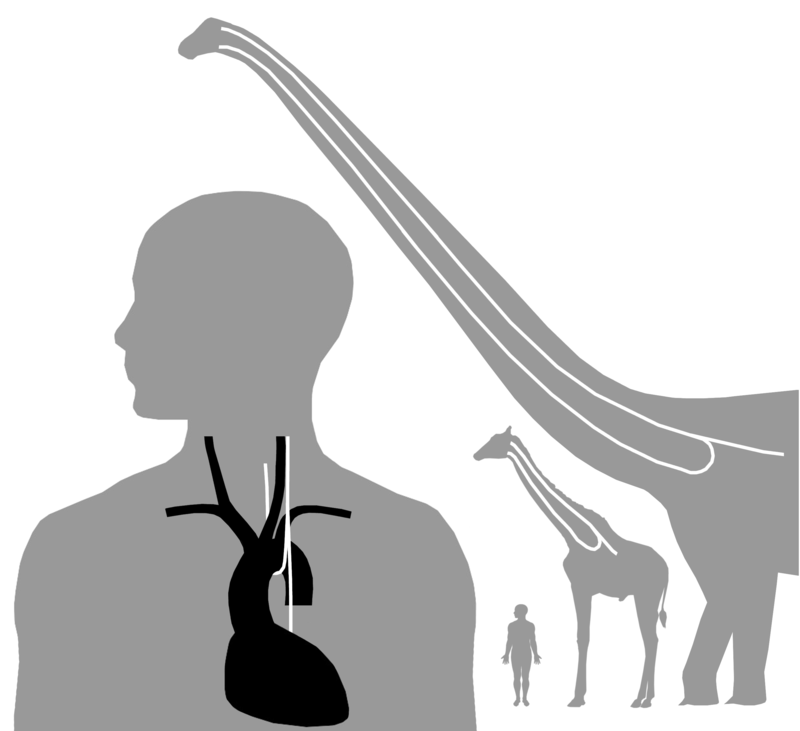 And we know that sauropod spinal cords were pretty small, relative to their body size, because the neural canals of their vertebrae, through which their spinal cords passed, are themselves small–Hatcher wrote about this more than a century ago. So there’s a tradeoff–sauropods could have had very fast, very fat axons, but not very many of them, and therefore poor “coverage” at their extremities, with nerve endings widely spaced, or better coverage with more axons, but those axons would be skinnier and therefore slower. We don’t know which way they went. Incidentally, you can experiment with the density of sensory nerve endings in your own body. Close your eyes or blindfold yourself, and have a friend poke you in various places with chopsticks. Seriously–start with the two chopsticks right together, and gradually spread them out until you can feel two distinct points (or, if you want to get really tricky, have your friend mix up the close and widely spread touches so there’s no direction for you to anticipate). The least sensitive part of your body is your back–over your back and shoulders, you’ll probably have a hard time distinguishing points of touch that are less than an inch apart. On your hands and face, you’ll probably be able to distinguish points only a few millimeters apart; in fact, for fingertips you’ll probably need finer instruments than chopsticks–maybe toothpicks or pins, but I take no responsibility for any accidental acupuncture! Simple reflex arcs are governed by interneurons in the spinal cord. The tail-tip-to-spinal-cord distance was a lot shorter than the tail-tip-to-brain route. 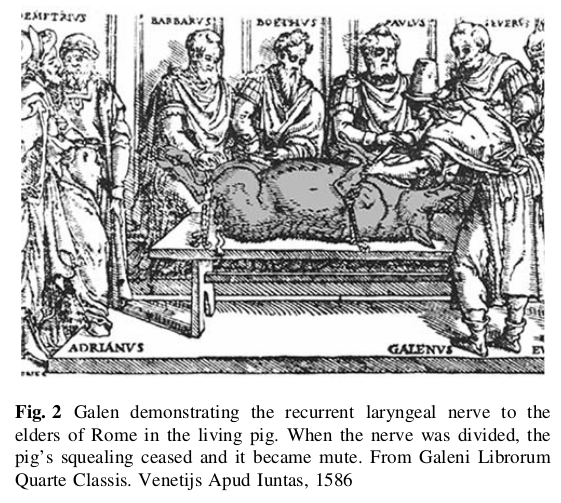 Even over the round trip of “sensory impulse in, motor impulse out”, it would have been at worst equal, and that’s assuming the nerve impulse had to go all the way to the base of the tail. * Call it half a second, max. 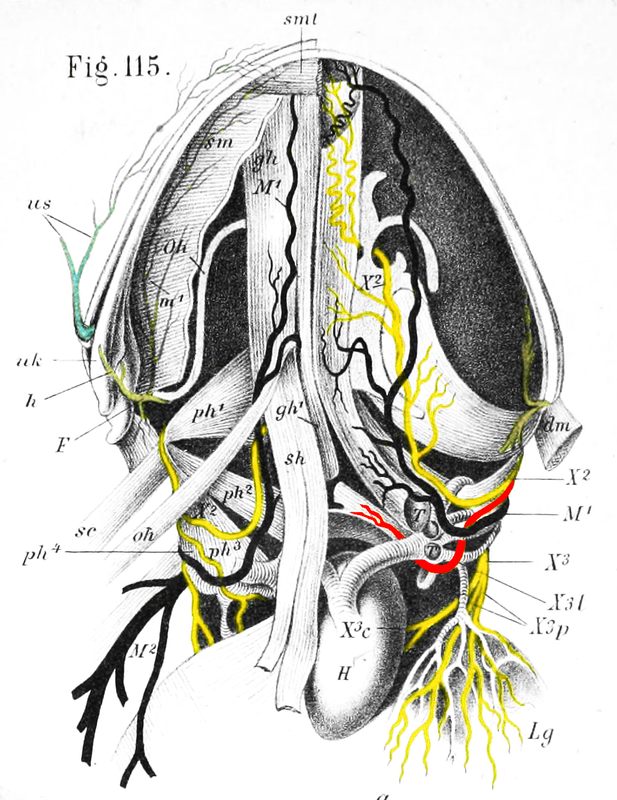 It gets worse: the peripheral nerves outside the spinal cord are not limited by the size of the neural canal, so they can be more heavily myelinated, with faster conduction times. For example, each of the sciatic nerves running down the backs of your thighs is much larger in cross-section than your entire spinal cord. If sauropod peripheral nerves were selected for fast conduction, they might have been bigger and faster than anything around today. Half a second is not much time for a theropod to formulate a plan, especially if Step 1 of the plan is “grab 150-foot sauropod by the tail”. All of this assumes the theropod only went for the bony whip-lash at the tip of the tail–the fastest-moving extremity, and the least-nourishing single bite anywhere on the target. If the theropod went for a meatier bite closer to the base of the tail, it would have to sneak closer to the sauropod’s head (better chance of being spotted), and the nerve conduction delay would be shortened. A 150-foot sauropod would probably mass somewhere between 50 and 100 tons, and would be capable of dealing incredible damage to even the largest theropods, which maxed out around 15 tons. There’s a good reason predators go after the young, sick, and weak. 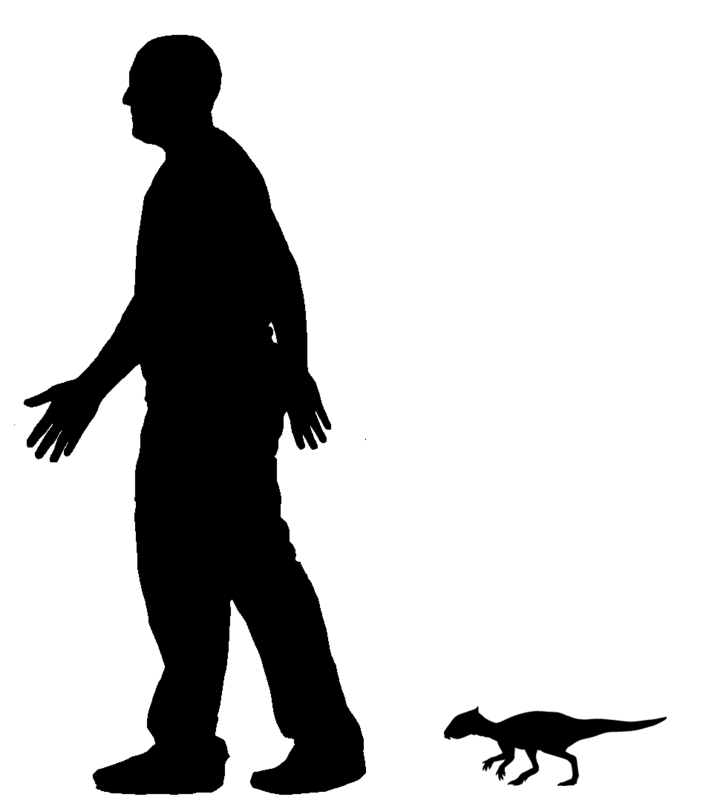 Smaller sauropods would be less dangerous, but they’d also have faster tail-to-central-nervous-system-and-back reaction times. A theropod big enough to go after a 150-foot sauropod would also be subject to fairly long nerve-conduction delays, which would limit whatever trifling advantage it might have gotten from such delays in the sauropod. So, although I have no doubt that in their long history together, giant theropods did occasionally tackle full-grown giant sauropods–because real animals do all kinds of weird things if you watch them long enough, and lions will take on elephants when they get desperate–I am extremely skeptical that the theropods enjoyed any advantage based on the “slow” nervous systems of those sauropods. * Some relevant hard-core anatomy for the curious: sauropods have neural canals in their tail vertebrae, and usually far down their tails, too. But that doesn’t mean much–you have neural canals to the bottom half of your sacrum, but your spinal cord stops around your first or second lumbar vertebra. 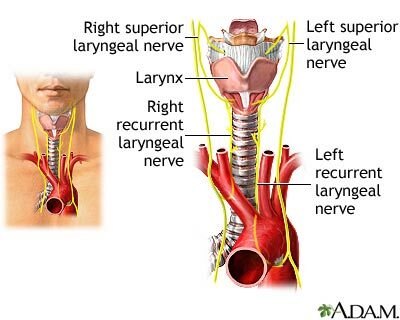 From there on down, you just have nerve roots. So the shortest reflex arc from your big toe has to go up to your lower back and return. Why is your spinal cord so short? Basically because your central nervous system stops growing when you’re still a child–it will add new connections after that, and a few new cells in your olfactory bulbs and hippocampus, but it won’t get appreciably bigger or longer. After mid-childhood, your body keeps growing but your spinal cord stays the same length, so you end up with this freaky little-kid spinal cord tucked up inside your grown-up vertebral column. Weird, huh? 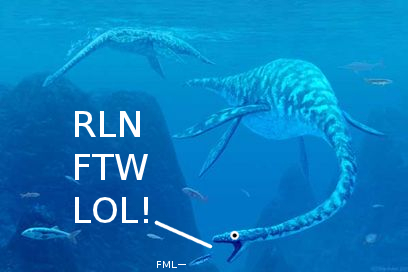 So did sauropod spinal cords stop at mid-back or go all the way into the tail? We have several conflicting lines of evidence. 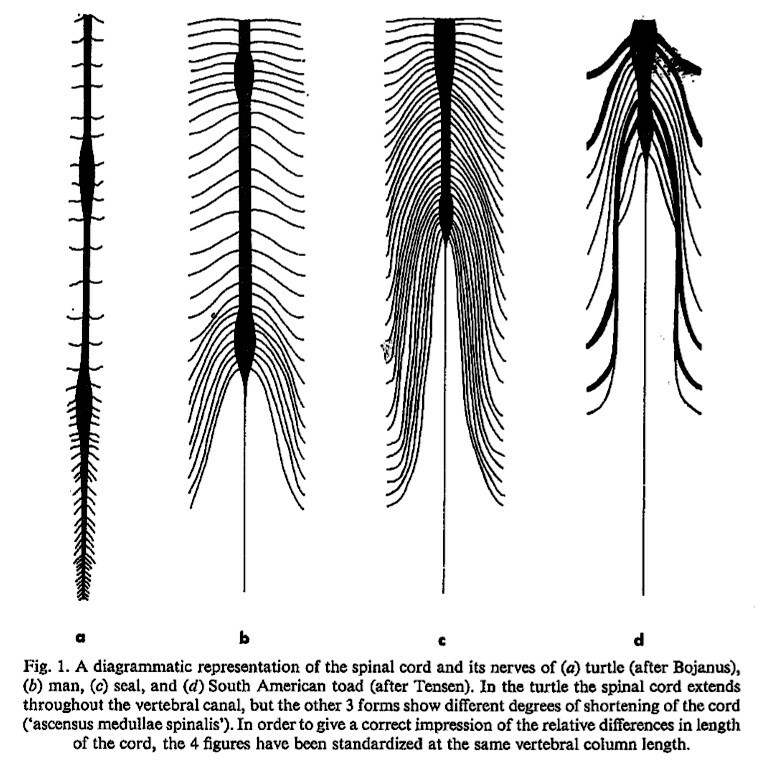 In extant reptiles, the spinal cord does extend into the tail in at least some taxa (I haven’t done anything like a complete survey, just read a couple of papers). 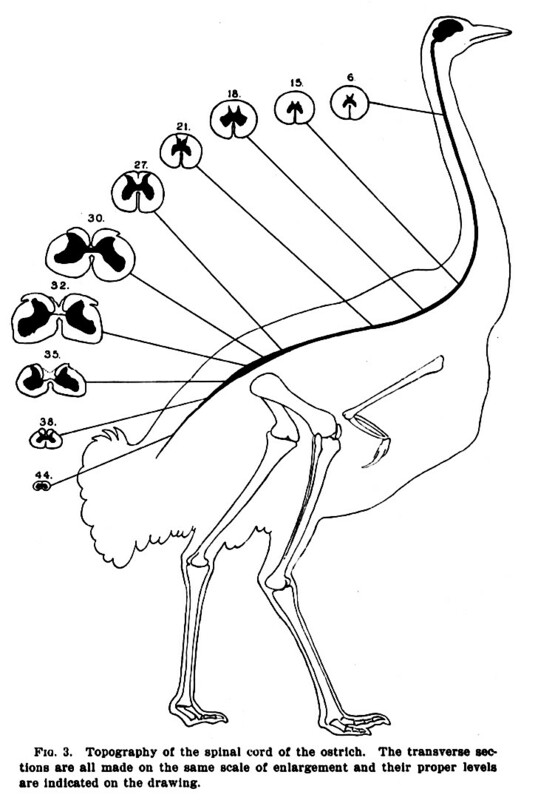 Birds are no help because their tails are extremely short, but their spinal cords do extend into the synsacrum (and expand there, thanks to the glycogen body, which was probably also present in sauropods and responsible for the inaccurate “second brain” meme). But then birds grow up very fast, with even the largest reaching full size in a year or two, so they don’t share our problem of the body outgrowing the nervous system. We know that sauropods grew pretty quickly, but they also took a while to mature–somewhere between one and three decades, probably. Did that protracted growth period give their vertebral columns the time to outgrow their spinal cords? I have no idea, because the division of the spinal cord into roots happens inside the dura mater and doesn’t leave any skeletal traces that I know of. Someone should go figure it out–or at least figure out if it can be figured out!